We’d love your help. Let us know what’s wrong with this preview of Live and Let Drood by Simon R. Green. The Secret Histories Novels combine “witty banter, tough guy standoffs, visceral fight scenes, bad guy atrocities, surprise revelations, and high stakes”* in supernatural adventures that can only come from the imagination of New York Times bestselling author Simon R. Green. The name is Bond, Shaman Bond. Better known as Drood, Eddie Drood Yes, I’m one of those Droods—the fa The Secret Histories Novels combine “witty banter, tough guy standoffs, visceral fight scenes, bad guy atrocities, surprise revelations, and high stakes”* in supernatural adventures that can only come from the imagination of New York Times bestselling author Simon R. Green. To ask other readers questions about Live and Let Drood, please sign up. Why is Simon R. Green taking so long making us wait through such an enormous cliff hanger not fair he should hurry up this is torture extreme torture! What will happen next? is every one dead? will we see the Armourer again? Damn how i hate waiting! OMG! OMG! the cover is so awesome!!! Read it, loved it, totally kickass! The 6th book of the Secret Histories series continues to be its merry self of gun fight, mass destruction, body counts, supernatural mayhem, sassy sense of humor etc etc. It's a quick and an enjoyable read with good entertainment value. 4 stars. Whoa...revelations and reunions in this one! Eddie and Molly are on their own in and the list of possible allies is long and terrifying with reasons aplenty not to request their aid. I do enjoy this series, even if it does seem more of a not-so-great spin-off from the Nightside---it's that James Bond touch with action, oddities, and gadgets. Really cool gadgets!! Have I mentioned how much of a gadget-girl I am... It allows Green great leeway in his monstrous bad guys with all sorts of sarcastic asides. Eddie, of course, is the quintessential supernatural James Bond with a heart of gold while Molly is the Bond girl, with a lot more power and snark. Naturally, politics are essential in any organization, and the Drood Family has their fair share. They just plan nastier. Methinks Molly doth protest too hypocritically. She certainly is attacking Eddie like nobody's business in this story. Phew. He does have a rather interesting comeback at one point with his response to her declaration that he was ready to work with the monsters. For that matter, why does Eddie have to hold to a higher standard than her?? Ooh, then there's that prejudice about half-blood Droods… What? Droods only marry Droods? Wouldn't that be a bit incestuous?? FINALLY. The family traitor is finally unmasked, and I must confess to being disappointed. It was too easy, and Molly has gotten a mite too cocky. Whoa, that's different. The trip that reveals a vast assortment of Drood Halls in other dimensions. It could be fun to visit a story in most any one of these. An interesting ending. A whole new category of possible bad guys and a potential new career, sort of, for Eddie. When we left Eddie and Mollie in For Heaven's Eyes Only , 5, they'd just come home from their vacation to find Drood Hall totally destroyed. All because of Alpha Red Alpha, and only chance allows them to learn that a slim hope exists. Eddie Drood, a.k.a., Shaman Bond, is a somewhat rebellious Drood agent who is supposed to be based in London. Mollie Metcalf, Eddie's girlfriend, is the witch of the wild wood and hated by most Droods. Feared by almost everyone actually. Isabella and Louisa are her formidable sisters. Arthur Drood was Martha's first husband; seems Eddie wasn't the first rebel with a conscience. Uncle Jack is the Armourer, or is it Uncle James? William is no longer the whacko Librarian with his new girlfriend around—Ammonia Vom Acht is the world's most incredible telepath. Ioreth is still William's assistant. Cedric (II) is still Serjeant-at-Arms. Callan is the Head of the War Room and Howard is in charge of Operations. The Wulfshead Club is supposed to be neutral territory, but no longer. Eddie and Shaman are both barred after events in For Heaven's Eyes Only . Ethel is the alien entity that took the place of the Heart. The scarecrows are the animated bodies of the Droods' worst enemies, and there are hundreds, including Laura Lye, a.k.a., the Liquidator, the water elemental assassin; Mad Frankie Phantasm; Roland the Headless Gunner; the Blue Fairy; and, the list just goes on forever. The dragon's head is still around. We can only hope he'll get his TV… Moxton was a family Armourer way back when who got obsessed with what the Drood family now calls Moxton's Mistake. The Department of the Uncanny is a government information-gathering organization. Catherine Latimer is the head of the Carnacki Institute which is based in Buckingham Palace. Dave Chapman is the head of Plunder, Incorporated, (used to be the Road Rats) and does he have a nasty surprise coming. Madame Osiris operates as a fortune-teller on Brighton Pier. The Uptown Razor Boys, a.k.a., The Eton Irregulars, are nasty feral things (hmmm, wonder if Green had a bad time at boarding school?). Bunny Hollis is an ex-SAS combat sorcerer. Seems the Droods are long-time members of The Establishment Club. Crow Lee is a necromancer and the Most Evil Man in the World—"he didn't join the Great Satanic Conspiracy because he thought they weren't extreme enough". No one can take him down, for he has too many allies at too many levels. Mr. Stab is playing bodyguard for a very particular fee. Major Tim Browten is a very formidable enemy with no compunctions. Unfortunately, Major Mike Michaels is even worse. The Droods sprang from a Druid back at the beginning, almost, of time who made a deal with an alien entity. While they have watched over the world, time has made them too arrogant and governments around the world are plotting their advantages with the Droods dead. The Immortals were an ancient Drood enemy—a human had reached the Heart first and made his own deal, a deal replicated by another. Oathbreaker is one of the destructive weapons held secure in the Armageddon Codex. Supposedly. The Original Traitor isn't even in it for the money. The cover is Eddie's salvation as the imprisoned creature in the Maze is his and the world's only hope. I did like the juxtaposition of the almost blinding white light revealing the creature while the ominous orange sky above darkens. More over the top insanity from Green. The Drood family is gone, wiped out, the Hall in ruins and Eddie is the only one left. Well, except for some rogues. So what's a super powered supernatural secret agent to do? Figure out who's responsible and kill them, of course. Slight problem. The invulnerable armor that is the trademark of the Droods isn't working. Part humor, part crazy action, part pop culture references, all standard fare for Green. This one continued from the biggest cliff hanger I remember from a Simon Green book. And I'm somewhat disappointed. Well, I know he wouldn't destroy all the Droods. But I still feel like he cheated. I think I said it in the review for the last book, but death doesn't matter in this universe. Only minor people die. Or people who were only introduced in the book you are reading. Like Grey Fox, Martha Drood, Penny Drood... all minor characters that we wouldn't really care about. I know these kinds of book aren't suppose to be emotionally deep, but a touch of sadness here and there would go a long way. It would certainly make us feel better when someone we thought is dead shows up again. The way things are right now, I wouldn't feel any of the important characters are in any real danger. It was like this in Live and Let Drood. I was sure there is an explanation. And I was sure Eddie and Molly would find a way. I think Mr Green is trying really hard to make a really scary secret organization in every one of his books. First it was the Droods themselves, and Scenechangers, and then the Hungry Gods and after that came the independent agent. And he continued the trend with the Immortals and Satanists. It doesn't work. He makes a big fuss about a terrible enemy, and then they take care of it like it is the easiest thing in the world. I mean, after the Hungry Gods, that eat worlds for breakfast, how are we suppose to get impressed? Crow Lee was a disappointment too. He was supposed to be the evilest man on earth. Couldn't he have better guards against a Drood? And Why didn't the Family do anything about him before? It was easy enough that a single Drood with a witch and a car could bring him down. And he had the Freakin oath breaker with him! And why didn't Eddie get more upset about Molly's sisters? They did try to bring down the whole family after all. I can't believe avenging people can be that stupid. The are suppose to be almost on the good side. And yet, they condemn a whole family for an almost justified execution, not the judge or the jury or the executioner, but the whole family that is mostly doing all the humanity favours. I think Mr Green knows this books flaws, and just don't care. Like the last chapter's name. He knew every one of his readers knows about Eddie's parents. But he didn't care that much. So he made a joke of the chapter's name. All in all, This book wasn't that bad. But the series is getting really repetitive. Again, if you like meaningless action about science and magic, or if you liked the previous books, read this. This review has been hidden because it contains spoilers. To view it, click here. Does anyone else remember the episode of the Simpson where Homer gets a job voice acting on "Itchy and Scratchy"? The character of Poochy turns out so unpopular that it almost gets the show permanently cancelled. The comic book guy informs Bart that it was the worst episode ever and "rest assured I was on the Internet within hours registering my disproval" The reason I bring this up is that I hope this will not be that kind of review. So let me start with the positives I have thouroughly enjoy Does anyone else remember the episode of the Simpson where Homer gets a job voice acting on "Itchy and Scratchy"? The character of Poochy turns out so unpopular that it almost gets the show permanently cancelled. The comic book guy informs Bart that it was the worst episode ever and "rest assured I was on the Internet within hours registering my disproval" The reason I bring this up is that I hope this will not be that kind of review. So let me start with the positives I have thouroughly enjoyed this series and Simon Greens other "Nightside" series. They have a wonderful tongue and cheek sensibility to them ,and the characters are very engaging especially John Taylor and Edwin Drood. Green creates wonderfully realized worlds as well. These traits are very apparent in this book as well. I just wish they were holding up a better plot. Edwin and Molly arrive back at Drood only to discover that it appears to have been destroyed. They very quickly find out that hall hasn't actually been destroyed but shifted to another dimension and a destroyed hall brought in from another dimension to take it's place. If you read "For Heavens Eyes Only" you already know how this was accomplished. They also very quickly find out the person responsible. The answering of these two questions so early on leaves the rest of the booking feeling somewhat padded and drawn out. In fact the whole point of this book seems to have been for Green to clear up old business. Many questions get answered here. We finally learn what exactly is trapped in the hedge maze? The identity of the much discussed Regent of Shadows is revealed as well as the Original Traitor. More importantly though we finally meet Eddie's parents. In face so much old business is delt with here that it almost feels like Green is winding this series down. "Shaman will return in Casino Infernle" I am hoping it will also be a better book. You really get a sense of the author enjoying writing this- there is a genuine feeling of wit & playfulness about not just this book, but the whole series. Although some quite disturbing themes do crop up, they are handled deftly, & in a way that doesn't drag the reader's enjoyment down. I read this book virtually straight through, I enjoyed it so much. I have to admit I am growing tired of this series as nothing much is really happening. I was able to guess every plot item many chapters before the main characters. It is frustrating to me that they cannot see the items (like how the author deals with the parents) and thus time is wasted attempting to build up anticipation that is simply not there. As one reviewer mentioned, same dialog and same jokes. For some this leads to comfort and familiarity while for me it just lead to boredom. I have rea I have to admit I am growing tired of this series as nothing much is really happening. I was able to guess every plot item many chapters before the main characters. It is frustrating to me that they cannot see the items (like how the author deals with the parents) and thus time is wasted attempting to build up anticipation that is simply not there. 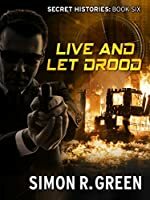 In yet another successful addition to the Secret Histories series, Live and Let Drood answered questions that have been out there since the first book in the series. And it left me wanting for more. Simon R Green really knows how to layer on the action while still making the characters engaging. I rate a book largely by my interest in the subject but mostly on whether I can build a picture of what is happening in my mind. Eddie Drood and Molly Metcalf take on the most Evil Man in the World. And In yet another successful addition to the Secret Histories series, Live and Let Drood answered questions that have been out there since the first book in the series. And it left me wanting for more. Eddie Drood and Molly Metcalf take on the most Evil Man in the World. And he is REALLY Evil! Aleister Crowley pales in comparison. A Drood without armor, a witch without powers, and a team without backup. Outstanding! I think I enjoyed this installment of the Secret Histories series more than any of them since The Man With the Golden Torc. Eddie and Molly, on the run from enemies unknown, with limited resources or support was lots of fun. 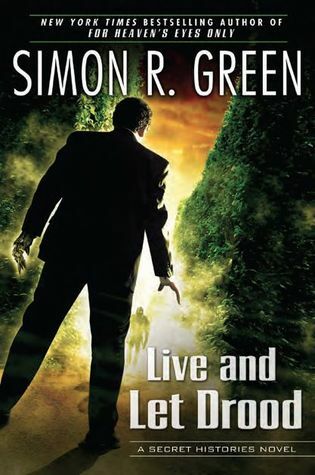 In between the large amounts of violence that come with any Simon R. Green book, that is. I love Simon R. Green. I love the first five in this series. The sixth book ... well, it's almost like the author was bored. It seemed like there was chapter after chapter after chapter of Eddie and Molly flapping their gums at each other - in fact, the first third of the book is just that; a lot of back and forth chatter between Eddie and Molly. So I guess I'm just massively disappointed because the book COULD have been fantastic - sadly, this one didn't work for me. Sigh. Not sure why, but I found this one difficult to get into. The story wasn't bad, neither was the action. I think it must have been the withdrawal from my last reading: At the Sign of Triumph by David Weber. Regardless, I slogged through. Typical Drood story with crazy characters and strange magics. Always fun to read. Part 6 and I am done for the moment. These books are entertaining but so similar that I reach a point where I have to stop and read something else. This is that point. Frankly I expect the series will continue along the same lines and I am looking forward to finishing it, but right now I need a break. the best installment of this series so far. Another good one. Much fun and mayhem. Long live the Droods! An intense romp, and quite viscerally gross at times. It was fantastic. Man, remember Deathstalker? I do. I read that stuff so long ago... and I remember it fondly. Really, I do. So I'm wondering why this book (and the Nightside series) are so friggin' terrible. Its all generally a linear progression of events within an overarching theme, which is all well and fine, except Eddie Drood never loses. His armor always beats X, Y, and Z. If Z happened to be something his old armor couldn't handle, well, his new armor can. If the new armor would have been torn apart by Y, Man, remember Deathstalker? I do. I read that stuff so long ago... and I remember it fondly. Really, I do. So I'm wondering why this book (and the Nightside series) are so friggin' terrible. Its all generally a linear progression of events within an overarching theme, which is all well and fine, except Eddie Drood never loses. His armor always beats X, Y, and Z. If Z happened to be something his old armor couldn't handle, well, his new armor can. If the new armor would have been torn apart by Y, Eddie happens to be wearing rogue armor immune to Y's effects. These stories are only ever interesting when some of the characters are threatened. The Immortal-backed assault on Drood hall is an example of this. The Hungry God War is another example. Mr. Stab and Penny. Basically, the series is only interesting whenever Eddie is overwhelmed by circumstance and his plot armor can't extend to protect everyone. Eddie Drood + Molly Metcalf one on one just walks through any threat they face. You can effectively skip forward for entire chapters because, spoilers, bullets bounce off rogue armor or are eaten up by strange armor, Eddie re-explains stuff the reader can still clearly recall from a previous chapter, aboriginal pointing bones fail to work, skeleton keys made by the Regent of the Uncanny transform into skeleton keys made by the Armourer for some reason, characters refer to themselves by the same long-winded titles as often as possible, Eddie browbeats bad guys down in comic fashion which leads to those bad guys admitting defeat in some charmingly comic British way (crying and stamping their feet, being sat on, screaming "cheat! // it's not fair!"). The difference in writing quality, what explains it? Well, two things, both of which interrelate to one another. The first is that I get the distinct impression that the author wrote the Drood / Nightside books exactly once. That would explain the repetitiveness of content -- he does not review and realize what is happening. The second is that first person narration is a coward's method of writing in general, but in Simon R. Green's case its double damning because the narrative frame is so overpowered that you rarely get any sense of tension. The Deathstalker books had multiple viewpoints, and occasionally the narrative of a viewpoint was torn apart by the rogue AI of Shub. Live and Let Drood is interesting for exactly the time it takes to establish that, spoilers, the destroyed Drood Hall is an alternate version of Drood Hall. end spoilers At that point, the family is "safe" from Eddie's point of view. The fact that they could have been sent into the heart of a star is not lingered upon. The whole story is about Eddie and Molly going to "interesting" places and doing "interesting" things to bring back the family. No tension, there. Ever wonder why Terry Pratchett didn't write sixty books about Rincewind? Because Terry knew that there was interesting, and then there was "interesting." He only had enough interesting stuff for Rincewind to run away from for a couple books. Simon ran out of interesting, and has been writing about "interesting" stuff for years now. This review has been hidden because it contains spoilers. To view it, click here. Please note there will be some minor spoilers in this review. Well, I suppose we had to know the Droods weren't really gone. I was pretty upset with that little cliffhanger from From Hell with Love and was very excited when I read the front flap of Live and Let Drood to find they were teleported to an alternate reality by some evil Mastermind. I was a little put off throughout the book by Eddie's constant repetitive statement of "Anything for the family" and his nagging "I'm right and you're wrong Please note there will be some minor spoilers in this review. I was a little put off throughout the book by Eddie's constant repetitive statement of "Anything for the family" and his nagging "I'm right and you're wrong" attitude about everything. I've always been much more of a John Taylor fan than an Eddie Drood fan so I may just be biased. Anyhow the main story follows Eddie and Molly as they try to track down the bad guy who knocked the Droods out of the world. A bunch of minor characters come in and try to stop them periodically, but the main focus of the story was spent on the duo trying to catch up to the Most Evil Man - Crow Lee. For having such a horrid reputation and supposedly being all that bad and Evil, I can't say I remember ever hearing of the guy before this novel. Usually the bad guy will be someone brought up in one of Green's other novels, even if in another series. So I was sort of disappointed to find out the bad guy was no one I knew of. Eddie decides to seek out a rogue Drood to help out with the manhunt. The Regent of Shadows and his crew at the Department of the Uncanny, including a very opinionated car, help Eddie and Molly return the Droods to the proper reality. Also, Louisa Metcalf makes her first appearance and quite honestly, she's a bit of a nutter. However, it's nice to finally have an image of all three Metcalf sisters. The best part about this installment? So many questions were answered. Too many serial novels end up adding questions on top of questions and never answering any in between. Green resolves the traitor in the family issue, the deal behind Eddie's parents' deaths, and the mystery of the hedge maze. 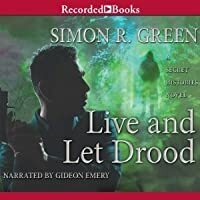 This is another entry to the Drood series by Simon R. Greene and it is just as good as the others. I feel like I benefited by not reading them all in a row however, as they can be formulaic. Eddie Drood is returning to the Famous Drood Manor after defeating the menace from the last book, together with his lady love Molly Metcalfe he is in high spirits. Until he rounds the corner and sees the total destruction of Drood Hall and, presumably, his entire family (Not really a spoiler, it happens like This is another entry to the Drood series by Simon R. Greene and it is just as good as the others. I feel like I benefited by not reading them all in a row however, as they can be formulaic. Eddie Drood is returning to the Famous Drood Manor after defeating the menace from the last book, together with his lady love Molly Metcalfe he is in high spirits. Until he rounds the corner and sees the total destruction of Drood Hall and, presumably, his entire family (Not really a spoiler, it happens like on the first couple of pages. And it's also on the back cover). The rest of the book is as you are probably imagining it. Eddie and Molly travel around getting information, i.e- punching people, until the mystery is solved. As I said at the start of the review, if I had read the series one after another it could've been very same-y. I tend to group these books with others of it ilk like The Dresden Files by Jim Butcher, The Felix Castor series by Mike Carey, and The Peter Grant Series by Ben Aaronovitch. Sure they are pretty different in location and sometimes tone, and the lead characters are mostly different from each other, but they do tend to follow a similar structure. There is a mystery that needs solving, people to beat up and get information from, and usually an interesting twist to the end. I personally can't get enough of any of these series, by your mileage may vary on how much you can stomach. I always have a fun time reading these books though. I feel that both Eddie and Molly are fleshed out well and act like real people most of the time. Molly has a tendency to grate on my nerves a bit here and there but as you read you can tell they love each other and fit well together and why. Nothing feels fake or unearned although they tend to repeat the same phrases a lot which can get annoying over time (another reason I'm glad I read these books spaced out a bit). If you couldn't tell by now, I'm frickin in love with all things Edwin Drood. This series can go on for as long as the James Bond franchise has, and I would be on cloud nine. The stories get more elaborate and outlandish as they go, just like the Bond movies. There are wonderful toys, over the top villains, and more humor than a marathon of old Laugh-In repeats. This is a series that never takes itself too seriously and has just the right level of snarky wit, even Oscar Wilde would find himself If you couldn't tell by now, I'm frickin in love with all things Edwin Drood. This series can go on for as long as the James Bond franchise has, and I would be on cloud nine. The stories get more elaborate and outlandish as they go, just like the Bond movies. There are wonderful toys, over the top villains, and more humor than a marathon of old Laugh-In repeats. This is a series that never takes itself too seriously and has just the right level of snarky wit, even Oscar Wilde would find himself easily entertained. The last few books have started almost as soon as the previous on ended, and Live and Let Drood is no exception. We are transported back into Eddie's world, within second of the last visit. He has just arrived back at the Hall to find it destroyed. His family is presumed dead, though the reader will notice a very significant lack of bodies . It's takes a bit, but our Eddie finally realizes things aren't as they appear to be and he swears to find his family and bring them back. Of course, he also swears vengeance on those responsible for the event, if he can figure that out. But with his Molly, The Wild Witch of the Woods, by his side, that should be a piece of cake. The problem is, getting to the man responsible, is easier said than done. Welcome to the 6th book in the Secret Histories series by Simon R Green, following the adventures of Edwin Drood and the love of his life the infamous Molly Metcalf. I can certainly say one thing for Simon R Green, he's certainly one for consistency and repetition. For those that don't know Mr Green has another series of books called The Nightside, and this series occurs within the same universe. however apart from some golden armour and a change in names, the 2 series could be pretty much interc Welcome to the 6th book in the Secret Histories series by Simon R Green, following the adventures of Edwin Drood and the love of his life the infamous Molly Metcalf. I can certainly say one thing for Simon R Green, he's certainly one for consistency and repetition. For those that don't know Mr Green has another series of books called The Nightside, and this series occurs within the same universe. however apart from some golden armour and a change in names, the 2 series could be pretty much interchangeable, The characters all have the same personalities, the main characters girlfriend is always slightly disturbing, and they all throw out the same phrases despite having never actually met. This is a series that's meant to be taken with a pinch of salt as is the Nightside, in both you never really get the impression that the main character's are ever really in any danger, and that takes a lot out of books that are meant to be action and suspense novels. In this incarnation of the Secret Histories Eddie returns home from a holiday with Molly to find Drood hall destroyed, however all is not as it seems and thus ensues a journey to try recover the missing Droods, there's a lot of new characters introduced though only 1 or 2 feel like they may have any lasting role in the series and as is a staple for this series there's some fight or action going off on every second page. What do you get if you take a James Bond fan; add a wicked sense of humor, a desire to write fantasy and a touch of brilliance? If you are lucky, you get Simon R. Green. If you have not been fortunate enough to read his work previously, buckle your seat belt, you are in for a fast, action filled ride. Happily, this book does work well as a stand-alone although you won’t understand some of the nuances without having read the previous tales. We start off with Edwin and Molly returning home, to fi What do you get if you take a James Bond fan; add a wicked sense of humor, a desire to write fantasy and a touch of brilliance? If you are lucky, you get Simon R. Green. If you have not been fortunate enough to read his work previously, buckle your seat belt, you are in for a fast, action filled ride. Happily, this book does work well as a stand-alone although you won’t understand some of the nuances without having read the previous tales. We start off with Edwin and Molly returning home, to find the entire family is dead and gone. The home destroyed and the vultures arriving to pick over the scraps. These are the people that (while not the nicest by any definition of the word) are entirely necessary to keep us normal folks safe from things that would otherwise enslave, butcher, eat or just destroy regular humans. There is a traitor that made it possible for Crow Lee (subtitled, deservedly so, the Most Evil Man in the World) to almost succeed in destroying the Drood family. Luckily, the family does survive, but Edwin and Molly do manage to (in the best Bond fashion) win. As a wise man once said, it is not the destination, but the journey that is important. This is definitely a fun journey. This reads like an action movie. So, if you like your action mixed with magic, evil villains and derring-do this book is definitely for you and you might want to check out the rest of his work, too. I know I will. "Anything for the family", words to live and perhaps die by. These words are the motto used by the Drood family to inspire loyalty and dedication to the family. What happens when Eddie Drood comes back to Drood Hall to find it a burned out devestated shell? He'll stop at nothing to punish those responsible. Thus begins his latest adventure, first thing to take care of; new armor. With the disappearance of Drood Hall and their ally the extra dimenional entity Ethel, Eddie must search the grounds "Anything for the family", words to live and perhaps die by. These words are the motto used by the Drood family to inspire loyalty and dedication to the family. What happens when Eddie Drood comes back to Drood Hall to find it a burned out devestated shell? He'll stop at nothing to punish those responsible. Thus begins his latest adventure, first thing to take care of; new armor. With the disappearance of Drood Hall and their ally the extra dimenional entity Ethel, Eddie must search the grounds of Drood Hall for anything to help him fight his new enemies. He finds a new armor, something called Moxton's Mistake. A living mechanical armor, which Eddie must convince to help look for the family and or those who attacked Drood Hall. Together with Moxton's Mistake and Molly Metcalf Eddie begins the search for Crow Lee,"the most evil man in the world". What follows is a rampage of destruction worthy of a Termanator movie as Eddie and Molly go in search of Crow Lee and the missing Drood family. I was going to write a review for this, than I wasn't going to, but I always feel I need to justify myself when I give less than 4 stars. To state it simply this book did not feel like a typical Simon R. Green novel. Big reveals were trivialized. Major decisions were made without explanations. Key details and important information was just skimmed over or skipped completely. There were many times I had 'hand to mouth' gasp moments at a reveal, while the characters of the book had little to no emot I was going to write a review for this, than I wasn't going to, but I always feel I need to justify myself when I give less than 4 stars. There were many times I had 'hand to mouth' gasp moments at a reveal, while the characters of the book had little to no emotion to life changing events. Every time a big issue would come up they blew it off and said 'we'll talk about that later' or 'we will discuss this when it is all over'. Only when they saved the day the book just ended. No answers, No resolution. This turned out to be one of my favourite books in the Secret Histories series. Live and Let Drood finds Eddie and Molly without the backup from the rest of the Drood family as they search for the cause of their sudden disappearance. Simon R. Green continues building out the Secret Histories Universe by providing more details on the Department of the Uncanny, the Carnacki Institute and the London Knights, as well as the villainous Crow Lee, and the Traitor in the Drood Family. As well, there's a This turned out to be one of my favourite books in the Secret Histories series. Live and Let Drood finds Eddie and Molly without the backup from the rest of the Drood family as they search for the cause of their sudden disappearance. Simon R. Green continues building out the Secret Histories Universe by providing more details on the Department of the Uncanny, the Carnacki Institute and the London Knights, as well as the villainous Crow Lee, and the Traitor in the Drood Family. As well, there's a great reveal at the end (which Green knew wasn't much of a surprise when he titled the chapter "Where the Monsters Are, and a Not Entirely Unexpected Surprise", which sets up the next book in the series really well.